We don’t always give ourselves the freedom to ask questions about the Bible. We think that we should already know the answers and don’t want to look stupid. Or we think that we’re not supposed to have questions about the Bible in the first place. For a sermon on the Prodigal Son, I decided to offer more questions than answers. What do you wonder about this parable? There is a Montessori-based Christian Education program called “Godly Play” that tells the stories of scripture and liturgical actions using simple wooden or felt props. A key component of this program is “wondering” language. Rather than focusing on correct or incorrect answers to questions, the leader invites the gathered group to wonder together about the story – what it might mean, where you might see yourself, and what it might tell us about what God is like. In Godly Play, the parables are very special things. Listen to how this lesson intro talks about parables, whose materials are stored in boxes: “Look! It is the color gold. Something inside must be precious like gold. Perhaps there is a parable inside. Parables are even more valuable than gold, so maybe there is one inside. Parables are fixtures of Jesus’ teaching in the Gospels. There are 42 parables in all, found in the Gospels of Matthew, Mark, and Luke. Some are repeated, and some show up only once. These stories that Jesus tells use everyday, accessible images and themes to help further illustrate a point. Sometimes, parables seem only to muddy the waters as we try to figure out what Jesus wants us to understand and take away. I like how the Godly Play lesson says that it’s easy to break parables. One way we break parables is by forcing the characters to represent things they weren’t meant to represent, or by stretching a metaphor further than it was meant to go. Sometimes we assume we already know what the parable is trying to tell us, or we think that there is only one meaning to be found. Though it is uncomfortable, or may leave us feeling unsatisfied, it can be a useful practice to explore our wondering, knowing there is no final say or correct answer. I spent a lot of this past week wondering about this parable Jesus tells. Will you enter this parable with me, and wonder with me? A man has two sons. The younger son decides that he is ready to leave home and asks for his portion of the inheritance. When his father gives it to him, he goes off and loses all the money in dissolute living. Eventually, things get so bad that he winds up sharing a sty with pigs and eating the pigs’ food to survive. It seems the story is almost over, but we’ve forgotten about a character. The older brother comes back from his work to find everyone celebrating without him. No one has bothered even to tell him what’s going on. When he hears all this party is for his younger brother, he refuses to go inside. Why should his brother receive a celebration for doing terrible things, when he, who has never done anything wrong, has never been granted a party? The father comes out and implores his child to come in, to join the celebration. And there the parable ends. We don’t know what happens next. I wonder. I wonder why the younger son wanted to leave home in the first place. Was he unhappy, bored, restless? I wonder if the younger son really meant his apology, or if it was just a way to get back in his father’s good graces? I wonder about the father. I wonder why he gave up half his land to the younger son. He didn’t have to. I wonder if he stood watching the road every day since his son left. It says he saw him while he was still far off. Had he waited there, watching, hoping, that today might be the day his son would return? I wonder about the older son. Did he realize that by hoarding and withholding, he too had squandered what he had? Did he ever join the party? Did he ever reconcile with his brother, or with his father? Or did his resentment continue to fester? I wonder how we are like these characters. I wonder how God is like them. I wonder what this story can teach us about ourselves and about God. I wonder how you are like the younger brother. Have you ever felt tired of the way things are, wanted something new, needed to prove yourself? Have you ever felt like you’ve ruined a chance you’ve been given? Have you ever felt like there’s no way you could make things right again? I wonder how you are like the older brother. Have you ever felt overlooked, taken-for-granted? Have you ever tried hard to prove your worth, only to get no recognition? Have you ever felt resentful of others, who seem to get all the attention even though they did little to deserve it? But mostly, I wonder about the father. I wonder if we shouldn’t give this parable a new name. We know it so well as the prodigal son. But what if we called it the Parable of the Waiting Father? The Parable of the Forgiving Father? The Parable of the Father and His Lost Sons? Because both sons are lost. Neither truly understands his father’s love. They both think that love is something to be earned, either by proper contrition or by working hard. They both think that there is a limited supply to go around. And at the end of the story, it’s the older brother that the father is waiting for. Waiting for him to come home, to come inside, to join the celebration. I wonder, how God is like this father. Throwing love and forgiveness around with abandon. Watching, pacing, hoping for the return of the lost one. Not keeping scores. Not building resentments. Overflowing with joy. Desiring reconciliation. Throwing a royal celebration when one he loves returns. Parables are even more valuable than gold, if we’re able to go inside them. I wonder, if we might continue to walk around in this one awhile. To see where it takes us. To see how it challenges us. To see if we might find ourselves in it. To see how we might be guided by it. I wonder if we might see hope and possibilities where we thought all was lost. I wonder if we might be able to let go of resentment and score-keeping. I wonder if we might join the celebration. I wonder. Why do bad things happen to good people? Why is there so much pain and hurt in the world? These and other questions underlie our gospel reading for this past Sunday, from Luke 13. Maybe it wouldn’t have mattered so much for another subject—history or math, maybe—but in this class, Lutheran Confessions, we were learning theology. And Dr. Wengert proved to us that it did matter why we were asking. If you want to know whether Lutherans recognize baptisms performed in other denominations just because you’re curious, you’re given a different answer than if you’re asking the same question because your cousin just told you your baptism doesn’t count. It makes a difference why the question is being asked. And we have quite the question in our gospel reading today: “Do you think that because these Galileans suffered in this way they were worse sinners than all other Galileans?” If Jesus didn’t say it, someone else surely would have. Some folks have come to Jesus with headline news of horror and tragedy. Pontius Pilate has slaughtered a group of Galilean Jews and mingled their blood with the blood of the sacrificial lambs. Meanwhile, the tower of Siloam has collapsed, crushing and killing eighteen people. Underlying these brutal accounts is a question as old as the human race: why? Why did these terrible things happen? Why is there so much pain in the world? Why does a good God allow human suffering? It’s a question that still plagues us. Why? Why were forty-nine Muslims killed while they were praying? Why were eleven Jews killed while they were praying? Why were nine Christians killed at Bible study? Why do bridges and buildings collapse? Why did the storm kill one person and the person standing next to them survived? Why does one person get cancer, and another doesn’t? Why do children get cancer? We can point to some explanations: to racism, to lack of attention to structures, to how genes mutate. But that doesn’t answer the question of why this person, and not another. Why that flight and not another? From the beginning of time these questions have plagued us, and still we have no satisfying answers. But that hasn’t stopped us from asking the questions. When unexplainably bad things happen, everything in us still longs to make sense of the senseless. Luke’s Gospel makes it clear that the people who bring this terrible news to Jesus already have an answer in mind. They are hoping that Jesus will verify their assumption that people suffer because they’re sinful. That people get what they deserve. That bad things happen to bad people. Because if that’s not true, it means that there is no sense, there is no order, about why one person dies in a tragedy and another doesn’t, about why one person recovers from an illness and another doesn’t. It means that we don’t necessarily get what we deserve. That bad things just happen, seemingly randomly. And that thought is terrifying. But Jesus refuses to say that suffering is a punishment for sin. In fact, he seems to say that asking about the cause of suffering is asking the wrong question. Or asking for the wrong reasons anyway. “No,” he says, “they did not die because they were sinful; but unless you repent, you will all perish as they did.” Really? Repent? What does repentance have to do with the inexplicability of disasters, whether natural or human-made? But for Jesus the question isn’t why is there suffering, why are there evil events in the world, but how should we live our lives in light of it? Are we going to repent—which here really means are we going to see the world in a new way, and let that new vision, new way of seeing, impact our actions—or are we going to turn a blind eye to the pain and hurt and suffering and continue with business as usual? Are we going to let these events affect us, drive us to compassion and care and change; or are we going to say that it’s someone else’s problem, that they deserved it? And Jesus, as he so often does, refuses to give a simplistic answer to a deep and complex question. He doesn’t try to solve deep troubles with quick fixes. Instead, he tells a story. There was a fig tree that wasn’t producing fruit. Hadn’t been, actually, for three years. The man who owned it told his gardener to cut it down. Why should I waste resources on this tree that won’t produce any fruit? But the gardener speaks up and asks for one more year. Just one more year. He wants to do what he can for the tree, care for it, tend to it, give it nourishment and assistance, and see if maybe, just maybe, it might bear fruit. I like to imagine that this is actually the third year this conversation is taking place. That each year, the gardener begs a reprieve. That next year, if the tree is still struggling, the gardener will say it only needs more attention and more care. When suffering happens, we’re left with a lot of questions. We’re left wanting answers that we may never get. But whenever Jesus encounters a suffering person, you never see him asking questions. He never asks what they’ve done. He never blames. Instead he gardens. He provides care and love. And when he comes upon someone the rest of us have thrown out, he insists upon that one’s fruitfulness. When reading any parable, it’s natural to ask the question—what part do I play? What part do we play? Perhaps sometimes we’re the owner, demanding that others meet our standards, and getting frustrated when they do not. Sometimes, we might be the gardener, speaking up for those who need extra help and love. Attending to those who need our care. But often, I think that we are the fig tree, and God is our gardener. Because God sees the ones that are struggling not as something to be cast aside, but as something that needs more care and attention. As those that need to be lovingly tended. Not ignored, not thrown out. When we are suffering, God sees. When we are struggling to produce good fruits, God pays attention. When we look around and question “why?” God hears our cries and responds with more care and more love. There are no easy answers to difficult questions. And there shouldn’t be, because easy answers don’t really respect how difficult the questions are. Jesus doesn’t offer us easy answers. But Jesus does offer us a God who gets down in the dirt and the manure, not seeking a quick fix, but seeking to cultivate. To tend and to grow and to help us in our struggle with difficult things. May we too become gardeners. Cultivators of what God has given us. May God grow in us love and empathy and compassion for others. Amen. The summer that I was eleven, my family took a road trip to what seemed like every national park in South Dakota, Wyoming, and Colorado. And after two weeks crammed into the minivan and motel rooms, my parents wisely realized we could all use something to shake us up. And that is how the Tancredi family, not a particularly adventuresome group by any standards, ended up on a beginner level whitewater rafting trip in Jackson Hole, Wyoming. You had the choice of sitting in the middle of the raft, where you would just experience the ride, or you could straddle the side of the raft, have an oar and really get into it. My mom chose to sit in the middle, but my dad, brother, and I all went for the side. Now, I’ve never been very gifted in the height arena, and at eleven, I was somewhere around four foot ten. I didn’t have a very good grip on this raft. I’m pretty sure my oar didn’t even reach the water. But I was bound and determined to at least do as well as my brother. We approached the first rapid, which was called “Little Kahuna.” It was the practice rapid, meant to get our feet wet. Well, more than my feet got wet. I went flying out of the raft and into the Snake River. I followed directions and was back in the raft in no time. As we came up to Big Kahuna, I told myself that on this rapid, I would redeem myself. I was not going to fall out. But as we entered the rapid, I felt myself falling. Only I was falling into the raft, not out of it. My mom had reached forward, grabbed the back of my life vest, and pulled me backwards into the safety of the raft. I was so mad, and embarrassed. She had ruined my shot at redemption. Afterwards, we bought those pictures that the company takes of you, you know the ones. We never bought pictures like that, but these were just too good. There were a series of four photos, showing the approach, the rapid itself, and the aftermath. So, you can still see to this day, on my parents’ living room wall, my mom go from fear to determination to relief as she keeps me safe. You can see me go from determination to shock to anger, as I realize what happened. She did what she had to in order to keep me safe, and I couldn’t believe she thought I needed her help and protection in the first place. God is like a mother hen, who wants nothing more than to gather her chicks in. To bring them close and safe in the shelter of her wings, to keep them from all harm. And her chicks aren’t so sure they need the help. Jesus compares himself to that hen, and laments that his chicks aren’t interested in what he has to offer. He offers love and safety and protection, and they return apathy and rejection and hate. There’s so much to unpack in just five verses from Luke, but what really stood out to me was Jesus’ feelings. Of course, we think of God as loving, as caring. But the anguish, the pain that Jesus feels aren’t usually the first emotions I associate with God. But of course, I don’t usually associate God with barnyard animals, either, and yet here we are. Jesus is resolute and determined in this short piece of Luke. He’s warned by some Pharisees that Herod wants to kill him, and he should get out of town. The Pharisees are often portrayed as one-dimensional figures, as Jesus’ adversaries, but here we see them trying to help Jesus. Jesus is determined, though. He knows that he is going to die, but he refuses to let this compromise his work, telling them that he is casting out demons and performing cures, and then he must go to Jerusalem. Jesus knows that he is going to die, and yet his lament is not for himself. His lament, his pain and his anguish, are for those who would be glad at his death. All of his emotion is poured out for those who cannot accept the good news that he brings. For those who refuse the shelter of his wings. That’s what Jesus is most upset about. Not that he will die. But that he cannot enfold all the people in his loving care, because they will not let him. It’s always tempting, when reading the stories of the Bible, to see those who oppose Jesus, or those who reject him and refuse him, to see them as the other people. It’s dangerous to do that, because not only might we miss the point but it can also lead to dangerous ways of thinking about our Jewish brothers and sisters. When we read these stories and Jesus faces rejection or opposition, we ought to ask ourselves, “Is that me? How am I like that?” What are the ways that we refuse God’s offer of care, of mercy, of love? And why do we resist being gathered under God’s wings? Maybe, like I resisted my mother’s protection through the rapids, we think that we don’t need it. That to admit we need help, we need love, we need forgiveness, is to admit to weakness. We don’t want to be chicks and rely on someone else. Maybe it’s the gathering in. That’s certainly part of why Jesus was resisted long ago. He longed to gather all people together in his arms. He ate with sinners and tax collectors, he praised Samaritans. To be gathered together under the mother hen’s wings is to be gathered in close with our fellow chicks. There’s a lot of potential discomforts here, to be gathered in with those that we don’t like. That we disagree with. That we just plain old don’t want to spend time with. It’s enough to make most chicks wary. And we have seen this week the devastating effects of our refusal to be gathered together, in the terrorist attack on Muslims in New Zealand. And maybe we don’t want to be gathered in because we just simply don’t like to think of God as a hen in the first place. Seriously, have you seen chickens? They can’t fly, they’re not too fast. This is how God is going to take care of us? But have you ever seen a mother hen gather her chicks when a predator approaches? I have, just once. Jesus’ mission will not be stopped, just as that mother hen will do everything in power for her chicks. Jesus will not be stopped by Herod’s threats. Jesus will not be stopped by rejection and condemnation. Because the work of God is more powerful than any resistance on our part. Despite our fears or anxieties, despite our claims of self-sufficiency, our wary eye cast towards our fellow humans, the work of God is stronger than all these things. Because the work of God is love. 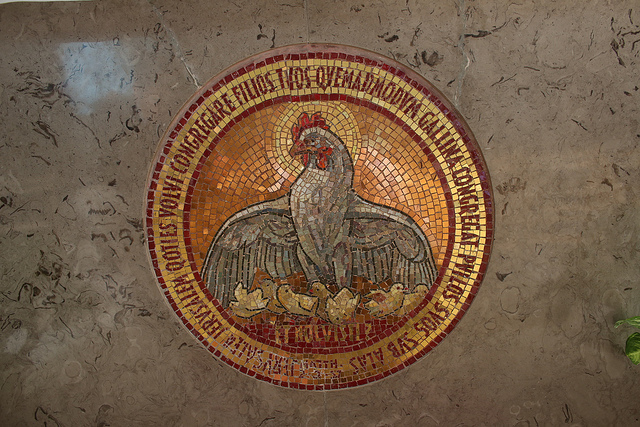 God covers us in the love of a mother hen, drawing us all in together. God’s deepest desire is to love us. We can fight it, we can think we’re ready to brave that rapid on our own. But that does not stop the protective Mother from reaching out and pulling us always into the heart of love, that there we may face whatever comes with God, and with our fellow chicks. Amen. “If.” Such a small word, but capable of so much meaning. “If.” It’s one of those tiny words that can completely change a sentence, a conversation, a thought. The word if can turn a statement into a question, a certainty into a doubt, a conviction into a hope. “If you are the Son of God,” begins the devil. The tempter doesn’t start right with offers or temptations for Jesus. No, the tempter is much smarter than that. He starts instead with that pesky word “if.” “If you are the Son of God:” turn these rocks into bread, seize power for yourself, prove your own worth. “If you are the Son of God.” The devil starts his assault on Jesus by sowing seeds of doubt, or at least by trying to do so. He calls into question Jesus’ very identity. If. Two letters that can take us from a place of security to a place of uncertainty. Two letters that can question our purpose, our value, our very identity. It’s constant. So constant that we might not always notice it anymore. Advertising, social media, the news, politicians: we’re constantly being told what we might be, what we might have, if only. They want to tell us that we only have value if. If we have certain things. If we live in the right house or drive the right car. If we eat the right things and exercise the right way. If we get good enough grades and go to the right school. If we come from the right countries or support the right policies. And once those seeds of doubt are there—that is when the tempter strikes. That’s when the devil tries to get Jesus to forsake God and to give up on his mission. And that’s when we are most tempted, too. To measure our personal value by the things we have or the things we achieve. To judge others based on those same barometers. To think that the size of our house or paycheck, or the grade on the transcript is what defines us. To base our sense of worth on our money, or worldly success, or power over others. And to make decisions driven by those insecurities. These temptations of Jesus—to turn stones into bread, to accept glory and power from what the devil has to offer, and to test God—they are all tied to this basic test of identity. Does he know who he is? And does he accept, believe, and trust who he is? Or does he feel the need to prove it by grasping at power? Jesus doesn’t give in to these temptations, because Jesus knows better than to accept the devil’s “if.” Knows better than to take this questioning of his identity for granted. Because he has heard the truth from a much more powerful voice. We always read this story of the temptation of Jesus on the first Sunday in Lent, which makes a lot of sense. Jesus spends forty days in the wilderness; we spend forty days in Lent. Jesus contends with the devil and temptation; we are called to contend with our own temptations and failings. It makes sense. But, it also means that we might forget that the temptation of Jesus comes directly after the baptism of Jesus. It’s the very next thing that happens. And at his baptism, as Jesus is coming up out of the water, the heavens open and the Spirit of God descends like a dove, and we hear this voice: You are my Son, my Beloved, with you I am well pleased. When Jesus goes into the desert, he goes with the waters of his baptism still dripping from his clothes. He goes with the name Beloved still ringing in his ears. He enters this confrontation with evil with the sure knowledge of who he is: the beloved son of God. With every offer the devil makes, Jesus instead chooses God’s power and God’s purpose. He knows he is the Son of God. He doesn’t have to prove it to the devil or anyone else. It is in God that we find our true identity. And there is no if here. We too receive from God an identity that is stronger than all the ifs and questions that life will throw at us. In our baptisms, we are told: You are a child a God. There’s no uncertainty, no doubts. Not if, but you are. You are a marvelous creation. You are loved by God. You are a child of God and you are a blessing. It’s not dependent on any “if’s”. It doesn’t matter if you have a lot or a little. You are loved. It doesn’t matter if you earn a lot or a little. You are loved. It doesn’t matter if you have five degrees or none. You are loved. It doesn’t matter if you’re old or young, weak or strong. You are loved. There are no ifs with God. You aren’t defined by what you do or what you make or how popular you are. You are defined by whose you are. You are defined as a child of God. Lest I seem naïve, I know that we are not Jesus. While he resists every temptation offered to him, you and I will not be so successful. I often give in to the temptation to define my own existence. To give in to those ifs and think that I need to prove my worth. To judge myself and my value by things I have or accomplish, and to judge society in a similar way. But here in this place, at this font and at this table, we are reminded that we are loved and valued—not for what we do, but simply for who we are: beloved children of God. And we can say to each other: You are beloved. You are valued. You matter. No ifs. We can remind each other that there are no ifs, because you are God’s beloved child. And we take that reminder with us, as Jesus took his into the desert. We take God’s love with us when we leave this place. We take the name Beloved with us. As we begin once more this season of Lent, let us begin as Jesus did during his forty days. Knowing how much God loves us, and how precious we are. Not if. But are. Amen. It’s Transfiguration once again! As I say in the sermon below, I’m never sure what to make of Transfiguration. Pretty much the same text comes up each year–with just slight differences between Matthew, Mark, and Luke’s accounts. But this year, when we read from Luke, we have the option to continue reading once Jesus leaves the mountain. And that’s where the Transfiguration starts to make sense for me. It’s not about some other-worldly place, it’s about real life. The transfigured Jesus is the same Jesus who leaves the mountain and who meets us in our everyday lives. Transfiguration is kind of a weird day. It’s always celebrated the final Sunday after Epiphany, the first Sunday before Lent begins. In one sense it’s the culmination of the season after Epiphany, we’re we’ve been experiencing who Jesus is, getting glimpses of the divine in water changed to wine, in sermons preached, and miraculous healings. Then suddenly, we don’t just get a glimpse, but we get Jesus’ divinity revealed in this blinding display on the mountain. I say it’s weird because I just can’t imagine it. Transfiguration seems like a day that is just tailor made for shiny, happy people. In his transfiguration, it says that Jesus’ whole appearance changes. He becomes bright. And Moses, after speaking with God face to face, is shiny. He’s so shiny and sparkly, reflecting the glory of God, that the people can’t look at him. He needs to veil his face because he has become so amazingly changed. Jesus on the mountaintop must be even more bright, because he’s not just reflecting God’s glory, he is it. It is shining forth from him, revealing what has been there all along, but now without hiding it. I can’t really imagine it, but it must have been like staring right into the sun. Blinding in its brightness. And often, I find Transfiguration difficult, because I want to experience that. I want to see God in all God’s glory. I want to shine from experiencing that brightness. I want to be one of the shiny, happy people. Isn’t that what we all want? At least in some form or another? We want to be happy, to be carefree, to bask in God’s power and glory, to shine so brightly that others around us can’t help but stop and stare. Can’t help but be in awe of us, and our shiny happy lives. I want to experience that, but I don’t always feel like I do. Sometimes I don’t feel shiny or happy. Sometimes I feel beaten down and frustrated at just how broken the world is. At the seemingly endless hate, prejudice, and pain that is experienced. Just this past week, our brothers and sisters in the Methodist church voted not to allow LGBT persons to get married or be pastors in their churches. Lest we think we have the moral high ground, the Lutherans only changed our position on this ten years ago, and there is still so much work to be done before we have true inclusion. That’s just one example from the news this week that makes me feel less than shiny and happy. As you know, there are countless others. But sometimes we want that shiny happy life so badly, that we pretend we have it even when it isn’t true. We put on the masks of shiny happy people. We act the part—either because it’s what we want others to see, or because we think it’s the right thing to do. We think that it’s somehow unfaithful to not always be shiny or happy. We think that if we let down that façade, if we admit to feelings of frustration and loneliness and pain, it means we don’t have enough hope or trust in God. Transfiguration is so shiny and happy it can make us want to shore up those façades, just in case we aren’t feeling that shiny ourselves. Transfiguration is that way until, of course, Jesus comes down the mountain. Our shiny, happy Jesus comes down the mountain and meets the suffering world once again. I always wonder what the Transfiguration must have been like for those left at the base of the mountain. Did Jesus’ light cast even a single beam down to those who waited in the dark? Did the crowd glimpse that ominous cloud that descended over Peter, James, and John? Did they hear even a rumble—distant like thunder—when God spoke to the disciples about listening to Jesus? We don’t know. We’ll never know. We do know that Jesus took three disciples—and only three—up the mountain to experience glory of God. And the remaining nine spent the night in anxious futility, trying in vain to do their Master’s good work. Presented with suffering and need and being unable to do anything to make it stop. But the Transfiguration doesn’t stop on the mountain. The Transfiguration isn’t just about shining, dazzling light. Transfiguration continues down in the valleys of real suffering and pain. Because we don’t just get to see Jesus for who he really is when everything is sunny and bright. We get to see Jesus for who he really is in the deepest moments of desperation. “Look at my son,” this desperate father cries. “Look at him.” His only child is seized by a spirit, he shakes and foams at the mouth, he yells out. Today, we might recognize this condition as epilepsy. All this father knew is that his only child was suffering. He held his whole world in his arms, and implored Jesus to look and see. And Jesus does. In the moments on the mountain, Peter, James, and John get to see Jesus for who he is. But Jesus is also revealed here in the valley. Jesus is revealed as a God who sees. As a God who cares enough to look at us. To see us. To see our needs. To see our suffering and pain, even if we try to hide it. To see our hopes and dreams and fears. Jesus is revealed as a God who changes us. He casts out the demon and heals the boy. He gives the disciples a mission and a purpose. Jesus tells us that God has hopes and dreams for this world and Jesus puts those hopes and dreams in motion. He lifts up the lowly, he embraces the outcast, he feeds the hungry crowds. Jesus is revealed as a God who is not afraid of suffering, but instead enters into it with us. A God who comes down off the mountain to meet us where we are, even if that place is scary and full of pain. Jesus never leaves us in that place alone. Because Jesus is revealed as God of transfiguration. A God of transformation. A God of resurrection. And we are desperately in need of it. Our world is desperately in need of it. When we encounter God, we are changed. We are made different. Sometimes that encounter happens on the mountaintop where things are shiny and happy. There’s nothing wrong with that. But sometimes that encounter happens in the valley, where our lives are scary and unsure. And there’s nothing wrong with that, either. Wherever it happens, when we encounter God, we are changed. We might not glow like Moses, but we too reflect the glory of God. It might make some people uncomfortable. Sometimes people aren’t comfortable encountering God’s expansive, boundary-crossing love. Sometimes people aren’t comfortable with how God changes us. With who God pushes us to be, or with whom God sends us to embrace. It might make us want to hide that light, to dim God’s love reflected in our lives. Let’s not do that. Let’s let that light shine. Because God is with us in every situation. God is with us on the mountaintops and in the valleys of our lives. Let’s bring that shiny, brilliant love of God to all that we do, letting it shine forth in our lives and into the world. Amen. When I played sports growing up (field hockey and lacrosse), I was often told that I was “scrappy.” I think that meant I wasn’t always as skilled as the other players, but I refused to let that hold me back. I would usually come out with a few bumps and bruises, and during one memorable lacrosse season I received the superlative award “Most Likely to Be Carded.” Maybe that’s why I’ve always loved the Flyers. They’re scrappy, too. Or better yet, gritty. As is Jesus’ message: it takes heart, it takes determination, and it isn’t always pretty. Let me know what you think! If you’ve been following along with our sports sermon series, you know that this week it’s all about Gritty, the newly unveiled mascot of the Philadelphia Flyers hockey team. And you might be wondering just what exactly Gritty has to do with Jesus’ sermon in Nazareth. Gritty is a seven-foot-tall, furry orange creature with googly eyes. Legend has it that Gritty emerged after construction work on the Wells Fargo Center, where the Flyers play, destroyed his natural habitat. Really though, the Flyers realized they were one of only three teams without a mascot, and wanted to get in on the fun. In designing Gritty, they agonized over every detail. How tall should he be, how long should his hair be, how big should his eyes be. They even debated whether or not to give him a belly button. But one thing that was never in doubt was his name: Gritty. They had a reputation around the league for their physical, rough style of play. Dave Shultz set a league record with 472 penalty minutes. Others teams criticized the Flyers, though, saying that they weren’t doing things the “right way.” They weren’t respecting the game. But in 1976, the Soviet Red Army team was touring the US in exhibition games. They’d been cleaning up. No one could beat them. They played like a well-oiled machine, every move perfect. The final game of the exhibition series would be in Philadelphia. Suddenly, the Broad Street Bullies, instead of being the black sheep, were America’s last hope for victory. Their play was so rough, that the Soviets left the ice, refusing to play. Only after they were threatened with the loss of their salaries did they return. The Flyers won easily, 4-1. The Bullies had proven that you could beat perfect precision with a lot of heart and some good old-fashioned grit. You might still be wondering, “What does this have to do with Jesus reading from the prophet Isaiah?” What is gritty about that wonderful promise that Jesus has come to announce the year of the Lord’s favor? To bring good news to the poor, and recovery of sight to the blind, and to let the oppressed go free? Jesus is, essentially, declaring his mission statement to the gathered crowds at the synagogue. Last week, I mentioned that turning water into wine was Jesus’ first public act of ministry in John. In Luke, it’s this reading. This is the very first thing Jesus does after being baptized and then tempted by Satan. He’s telling us what his ministry is going to be about and although it might not seem like it at first, it’s going to be gritty. Jesus comes to bring good news, to announce God’s salvation. But good news isn’t always easy news, or comfortable news. Sometimes, it’s challenging news. Notice how specific this announcement is: good news to the poor. Release to the captives. Freedom for the oppressed. What if you’re not a captive? What if you’re not only not oppressed, but privileged? What if you’re not poor, but might in fact, have more than enough? This good news just got a little more complicated. When Jesus mentions “the year of the Lord’s favor,” he’s talking about the Jubilee year. The time, every fifty years, when all debts are forgiven, all slaves are freed, all lands are returned to their original owners. Good news if you’re a slave, or in debt, or lost your land. Not so great if you own slaves, or own debts, or acquired land in the last fifty years. This good news is starting to seem a little offensive. People are starting to question whether it’s good news at all. The very next thing that happens after our reading today—the people of Nazareth, Jesus’ friends and neighbors, people who have known him all his life—they run him out of town and try to throw him off a cliff, because they are very sure that this is NOT good news. They don’t succeed, but others will, later on, when they crucify Jesus for living out this very mission. They didn’t think it was good news, either. So, what do we think? What do we think of this Jesus who has come to bring salvation, who has come to announce the year of the Lord’s favor? Is it good news for us? Or is it troubling? Perhaps it’s both. Because the announcement of the year of the Lord’s favor might mean difficult things for us. It might mean giving up some of the things that make us privileged in the name of justice. God’s jubilee might mean that we have to adjust the way we do things. But Jesus’ announcement—that he has come to bring good news to the poor, recovery of sight to the blind, to set the oppressed free—it is surely good news for us and for all people. It might be complicated, it might be messy, but it is most definitely good. Because it means that God comes to bring salvation, not for the perfect but for the imperfect. Not for the healthy, but for the ill. Not for the righteous, but for the unrighteous. Not for the strong, but for the weak. God comes to bring salvation, that is, for us. God comes to free us from what keeps us bound, to make whole what is broken, to bring hope where there is despair, forgiveness where there is pain and new life where there is emptiness. And not just to us, but to all society. In the Jubilee year, the land itself was restored and renewed. God’s salvation is for all the earth, that our world and society might be set free from hate, from evil, from greed. And that salvation is now. Jesus gives possibly the shortest sermon ever after he reads from Isaiah. Just nine words: Today this scripture has been fulfilled in your hearing. Today. God’s good news, with all its complexities, with all its grittiness—it isn’t waiting from some distant future day. Today, this day, God brings release. Today, God brings liberation. Today, God brings healing and renewal. Because today, we receive the same one who declared his mission in Nazareth all those years ago. May we receive the healing, hope, and good news he brings. And may we make his mission our own. Amen. Welcome to Week 2 of our Phanatics sermon series. This week, the Philadelphia Eagles. (Unfortunately, they didn’t give us a win last week, but the message is still a good one!) I have to say, the Wedding at Cana is probably one of my favorite stories from the Gospels. There’s so much interesting stuff packed into these verses. Why does Jesus respond so abruptly to his mother? What does it mean that his hour has not yet come? Is there any significance to the number of jars? What role do we most identify in this story? There’s so much here, it’s hard to choose one focus point. But this time around, I chose to focus on the abundance that Jesus provides. Let me know what you think! When I’m performing a wedding, I always tell couples that something is going to go wrong. I’m not trying to scare them, or to tempt fate, but simply to prepare them. And to manage expectations. Something is going to go wrong. There’s so many moving parts in a wedding, it’s almost inevitable. For Tim and me, it was the shuttle that was supposed to get guests to and from the reception. It got them there, but it never came back at the end of the night. Luckily, that one was easily solved with a phone call to the hotel and an extra 15-minute wait. Sometimes, someone spills something. Or a groomsman forgets his cufflinks. Or someone’s running late. It might not be disastrous, but usually something goes wrong. I tell couples that, and then I tell them not to worry about it, because they’re going to end up getting married anyway. Even with something going wrong, at the end of the day they will be married and that is the most important thing. Sometimes, the things that go wrong are a bigger problem than a late shuttle, though. The problem our wedding couple at Cana is running into is actually a huge deal. They’ve run out of wine. This isn’t, of course, a situation where you can just go get some more. Running out of wine is more than just embarrassing, as it would be today. In the ancient world, hospitality, how you treated guests, was hugely important. Weddings were weeklong affairs, where everyone would come to the groom’s house to celebrate the couple. Hosting this crowd was an honor and a way to display the importance of the family. This couple, and their families, risked not just embarrassment, but shame. Loss of their social standing and a negative reputation. And Mary takes notice of this. It’s not clear really if anyone else has noticed, but Mary at least is paying attention. And, concerned for the couple, she brings this problem to Jesus, telling him, “they have no wine.” Jesus, almost reluctantly, eventually listens to his mother and solves the problem, turning water into wine. It’s a miraculous solution to the problem, but it’s not just miraculous, it’s extravagantly so. There’s six jars, holding twenty or thirty gallons each. Someone better at math than me did all the conversions to realize that we’re talking about almost 1,000 bottles of wine. And not just any wine, the steward notes. He hasn’t seen the miracle but is amazed anyway. This is the good stuff. Once the guests are drunk, most people are serving Franzia straight from the box, but here, at the end, is the best wine of the celebration. Jesus’ response to the problem of no wine is not a simple fix. This first miracle, his first public act of ministry in the Gospel of John, it isn’t a healing or an exorcism, or a teaching. But instead it’s an absolute abundance. An overflowing amount of joy. He provides so much more than is needed. I think sometimes we all fall victim to the mentality of looking around us, and only seeing what we don’t have. Only seeing holes, only seeing what’s lacking. “We all we got, we all we need,” became the motto of the Philadelphia Eagles last season. Unfortunately, it didn’t exactly play out well for them last Sunday night. But last year! Last year, after their star quarterback Carson Wentz had a season ending injury in December, team leader and safety Malcolm Jenkins gave an inspiring speech in the locker room after the game. He knew that many people would now be saying that the Eagles had no chance in the playoffs without Wentz. That they didn’t have what it took. And he declared to his teammates, “We all we got, we all we need.” Believe that everything we need to succeed is right here. Look around this locker room and instead of seeing what’s missing, see what’s here. He used a little more colorful language than that, of course. But he was right. The Eagles did have all they needed. And they won the Super Bowl. It started with a mindset of seeing what they had as being enough. God provides abundantly far more than we need. I’m not talking about points on a scoreboard or players in the starting lineup. Those things are fun for us sometimes, but they’re definitely not what God is most concerned with. God provides for so much more important needs: love, the ability to care for each other, gifts and talents and passions. Only sometimes, we get so caught up in the idea that there isn’t enough, that we’re unable to see the abundance right in front of us. Instead of living with the mindset of abundance, we live with the myth of scarcity, believing that there isn’t enough. When we live our lives by the myth of scarcity, we are never satisfied but always wanting. When we live our lives by the myth of scarcity, we are always in competition with every other form of life on the planet. When we live our lives by this myth, other peoples’ successes, other peoples’ blessings, become bad news for us because we think we’re all fighting for the same small pool. But in this story of water turned into wine, we have a powerful new narrative by which we can live new lives. We can be generous. We can take risks. We can act like guests at a wedding feast, filled with thanksgiving and joy. We can stop viewing fellow human beings as our competition and instead see them as our companions. Because we do in fact have enough. Sometimes, we might need to ask ourselves what “enough” really looks like. Because we have enough food on this planet to feed everyone, and yet people still starve. We have enough space to house everyone, and yet people are still homeless. We have enough, but we often don’t use it well enough to care for everyone. But God has given us enough. God has given us more than enough, because God has given us God’s very self. We are called to be the stewards of what God has given. The steward in our story is amazed and overjoyed at what God has done (although he doesn’t know who did it). But he sees this miracle of abundance and simply delights in it. And then, because he is the steward, he would have shared it. He would have made sure that everyone had a taste of this marvelous abundance. We are God’s stewards in this world. We have been tasked with caring for what God has given us. Like the steward in Cana, we can delight in how magnificent that is. How deeply satisfying, how nourishing, how fulfilling it is. And then we can take up the task of seeing that what God has given us—our lives, our ability to care, our resources, and God’s own love—is spread around. Is shared with all those in need. “We all we got, we all we need.” The Eagles were on to something in the way they chose to view their situation. They saw abundance instead of lack. There’s a lesson there for all of us. We do in fact have all we need, but only because we have something much bigger than ourselves. We have God, who gives generously and abundantly, fulfilling our needs with overflowing grace. Amen.